(Oct. 9, 2016) – The Western New York Flash lifted the 2016 NWSL Championship trophy at BBVA Compass Stadium in Houston after goalkeeper Sabrina D’Angelo made three saves to propel her team to a 3-2 victory over the Washington Spirit in the first penalty shootout in league history following a 2-2 draw. In a game of big moments from a pair of NWSL MVPs, Spirit forward and 2015 MVP Crystal Dunn turned in a two-goal performance – handing her team the lead with the opening goal of the match in the 9th minute as well as in the first-minute of extra time. But as Western New York had so many times this season, the Flash fought their way back into a match in which they’d fallen behind. With coach Paul Riley watching from the stands as he served a suspension after being ejected from the semifinals, he saw midfielder Samantha Mewis level the match in the 14th minute – and then watched as 2016 MVP and Flash forward Lynn Williams netted the game-tying goal in the 124th minute, just seconds before the final whistle. The two goals were the 10th and 11th times in 2016 that Western New York was able to recover from a deficit to tie the game. The Flash become the first No. 4 seed to win the NWSL Championship after they sealed their place in 2016 postseason with a win in their final game of the regular season that snapped a seven-game winless streak. See below for a breakdown of all the action. Goals: FLASH – Samantha Mewis 14’; Lynn Williams 124+’. SPIRIT – Crystal Dunn 9’, 91’. The Breakdown: The Washington Spirit opened the scoring for the 16th time in 22 games this season in the 9th minute when forward Crystal Dunn got on the end of a well-weighted long ball from defender Megan Oyster and rounded Western New York Flash goalkeeper Sabrina D’Angelo before she slid her shot into the vacated net from a sharp-angle while falling to the ground. The goal was the first time an NWSL MVP scored in the NWSL Championship Game as Dunn – the league’s MVP in 2015 – found the back of the net for just the third time this season (including playoffs) after scoring 15 times in a NWSL Golden Boot winning campaign last year. The lead was short-lived, however, as Flash midfielder Samantha Mewis leveled the score in the 14th minute when she collected a pass from forward Lynn Williams before creating space to rip a low shot past Washington goalkeeper Kelsey Wys and just inside the far post from 23 yards. It was the third consecutive game with a goal for Mewis stretching back to the final match of the regular season – with all three goals coming in the first half of those contests. Spirit defender Caprice Dydasco was forced off through injury in the 22nd minute, but returned to the sidelines in the second half to support her teammates. The teams traded chances over the final 76 minutes in regulation – with Washington midfielder creating the best opportunity in the 33rd minute as a change of pace took her into a gap in the Flash defense before she unleashed a low shot that forced a full-stretch save from D’Angelo. But just as both semifinal matches did, the 2016 NWSL Championship Game went to extra time with the score knotted at 1-1 and the 8,255 fans at BBVA Compass Stadium didn’t have to wait long for the action to pick up as Dunn scored her second goal of the match in the 91st minute. Less than a minute later, Mewis nearly replicated her equalizer from the first half with a shot that forced one of the four saves on the night from Wys. But as they’d done all season, the Flash found a way back into the match – this time with Williams heading home the game-tying goal in the 124th minute to send the match to penalties as she became the first reigning MVP to score in a championship match in the league’s history. Ten of Williams’ 14 goals (including playoffs) came after halftime this year. Moment of the match: Western New York goalkeeper Sabrina D’Angelo made her third save of the shootout to send the Flash to their first NWSL Championship. D’Angelo stopped shots from Ali Krieger, Victoria Huster and Diana Matheson in the first penalty shootout in the four-year history of the NWSL Championship Game in a performance that meant that she became the first goalkeeper to win the NSWSL Championship Game MVP award. Match ends, Washington Spirit 2(2), Western New York Flash 2(3). Penalty Shootout ends, Washington Spirit 2(2), Western New York Flash 2(3). Penalty saved! Diana Matheson (Washington Spirit) fails to capitalise on this great opportunity, right footed shot saved in the centre of the goal. Penalty saved! Samantha Mewis (Western New York Flash) fails to capitalise on this great opportunity, right footed shot saved in the bottom left corner. Penalty saved! Victoria Huster (Washington Spirit) fails to capitalise on this great opportunity, right footed shot saved in the bottom left corner. Goal! Washington Spirit 2(2), Western New York Flash 2(3). Lynn Williams (Western New York Flash) converts the penalty with a right footed shot to the bottom right corner. Goal! Washington Spirit 2(2), Western New York Flash 2(2). Katherine Stengel (Washington Spirit) converts the penalty with a right footed shot to the bottom left corner. Penalty missed! Bad penalty by Jessica McDonald (Western New York Flash) right footed shot is too high. Jessica McDonald should be disappointed. Goal! Washington Spirit 2(1), Western New York Flash 2(2). Christine Nairn (Washington Spirit) converts the penalty with a left footed shot to the bottom left corner. Goal! Washington Spirit 2, Western New York Flash 2(2). Jaelene Hinkle (Western New York Flash) converts the penalty with a left footed shot to the bottom left corner. Penalty saved! Ali Krieger (Washington Spirit) fails to capitalise on this great opportunity, right footed shot saved in the top left corner. Goal! 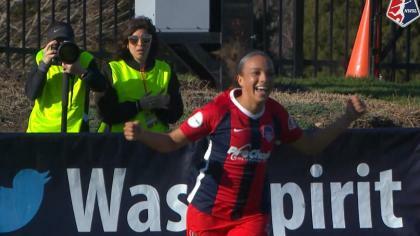 Washington Spirit 2, Western New York Flash 2(1). Abby Dahlkemper (Western New York Flash) converts the penalty with a right footed shot to the bottom right corner. Penalty Shootout begins Washington Spirit 2, Western New York Flash 2. Second Half Extra Time ends, Washington Spirit 2, Western New York Flash 2. Goal! Washington Spirit 2, Western New York Flash 2. Lynn Williams (Western New York Flash) header from the centre of the box to the top right corner. Assisted by Jessica McDonald with a cross. Kelsey Wys (Washington Spirit) is shown the yellow card. Offside, Washington Spirit. Christine Nairn tries a through ball, but Crystal Dunn is caught offside. Attempt saved. Diana Matheson (Washington Spirit) right footed shot from the right side of the box is saved in the bottom left corner. Assisted by Ali Krieger with a through ball. Attempt blocked. Crystal Dunn (Washington Spirit) right footed shot from the right side of the box is blocked. Assisted by Katherine Stengel. Offside, Washington Spirit. Ali Krieger tries a through ball, but Crystal Dunn is caught offside. Attempt blocked. Crystal Dunn (Washington Spirit) left footed shot from a difficult angle and long range on the right is blocked. Assisted by Ali Krieger. Attempt saved. Samantha Mewis (Western New York Flash) right footed shot from the centre of the box is saved in the centre of the goal. Assisted by Jaelene Hinkle with a cross. Attempt saved. Crystal Dunn (Washington Spirit) right footed shot from the left side of the box is saved in the bottom right corner. Assisted by Katherine Stengel. Substitution, Washington Spirit. Katherine Stengel replaces Francisca Ordega because of an injury. Hand ball by Ali Krieger (Washington Spirit). Attempt missed. Taylor Smith (Western New York Flash) right footed shot from the right side of the six yard box is close, but misses to the right. Assisted by Lynn Williams with a cross. Second Half Extra Time begins Washington Spirit 2, Western New York Flash 1. Substitution, Western New York Flash. Kristen Hamilton replaces McCall Zerboni. First Half Extra Time ends, Washington Spirit 2, Western New York Flash 1. Offside, Western New York Flash. Abby Erceg tries a through ball, but Taylor Smith is caught offside. Kelsey Wys (Washington Spirit) wins a free kick in the defensive half. Attempt saved. Lynn Williams (Western New York Flash) right footed shot from outside the box is saved in the centre of the goal. Assisted by McCall Zerboni with a headed pass. Offside, Washington Spirit. Megan Oyster tries a through ball, but Crystal Dunn is caught offside. Offside, Washington Spirit. Victoria Huster tries a through ball, but Francisca Ordega is caught offside. Attempt saved. Ali Krieger (Washington Spirit) left footed shot from the centre of the box is saved in the top right corner. Corner, Western New York Flash. Conceded by Alyssa Kleiner. Attempt saved. Samantha Mewis (Western New York Flash) right footed shot from outside the box is saved in the top left corner. Assisted by Taylor Smith. Goal! Washington Spirit 2, Western New York Flash 1. Crystal Dunn (Washington Spirit) left footed shot from the right side of the box to the top right corner. Assisted by Ali Krieger. First Half Extra Time begins Washington Spirit 1, Western New York Flash 1. Second Half ends, Washington Spirit 1, Western New York Flash 1. Attempt missed. Ali Krieger (Washington Spirit) right footed shot from outside the box is close, but misses the top right corner. Assisted by Crystal Dunn. Offside, Washington Spirit. Ali Krieger tries a through ball, but Diana Matheson is caught offside. Offside, Western New York Flash. McCall Zerboni tries a through ball, but Jessica McDonald is caught offside. Attempt missed. Jaelene Hinkle (Western New York Flash) right footed shot from outside the box is high and wide to the left. Assisted by McCall Zerboni. Delay in match Sabrina D'Angelo (Western New York Flash) because of an injury. Sabrina D'Angelo (Western New York Flash) wins a free kick in the defensive half. Foul by Victoria Huster (Washington Spirit). Taylor Smith (Western New York Flash) wins a free kick in the defensive half. Hand ball by Jaelene Hinkle (Western New York Flash). Foul by Megan Oyster (Washington Spirit). Jessica McDonald (Western New York Flash) wins a free kick in the defensive half. Corner, Washington Spirit. Conceded by Elizabeth Eddy. Substitution, Washington Spirit. Diana Matheson replaces Estefanía Banini. Foul by Ali Krieger (Washington Spirit). McCall Zerboni (Western New York Flash) wins a free kick on the left wing. Offside, Washington Spirit. Shelina Zadorsky tries a through ball, but Ali Krieger is caught offside. Attempt blocked. Christine Nairn (Washington Spirit) right footed shot from outside the box is blocked. Crystal Dunn (Washington Spirit) wins a free kick in the attacking half. Foul by Crystal Dunn (Washington Spirit). Alanna Kennedy (Western New York Flash) wins a free kick in the defensive half. Delay in match Estefanía Banini (Washington Spirit) because of an injury. Hand ball by Crystal Dunn (Washington Spirit). Attempt saved. Lynn Williams (Western New York Flash) right footed shot from the centre of the box is saved in the bottom left corner. Assisted by Makenzy Doniak with a cross. Corner, Western New York Flash. Conceded by Shelina Zadorsky. Corner, Washington Spirit. Conceded by Samantha Mewis. Attempt blocked. 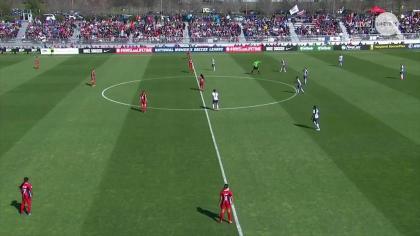 Crystal Dunn (Washington Spirit) left footed shot from the right side of the box is blocked. Assisted by Ali Krieger. Attempt blocked. Estefanía Banini (Washington Spirit) right footed shot from outside the box is blocked. Assisted by Christine Nairn. Ali Krieger (Washington Spirit) wins a free kick on the right wing. Corner, Western New York Flash. Conceded by Ali Krieger. Delay in match Ali Krieger (Washington Spirit) because of an injury. Offside, Washington Spirit. Crystal Dunn tries a through ball, but Francisca Ordega is caught offside. Christine Nairn (Washington Spirit) wins a free kick in the defensive half. Foul by Samantha Mewis (Western New York Flash). Lynn Williams (Western New York Flash) wins a free kick in the defensive half. Attempt missed. Makenzy Doniak (Western New York Flash) right footed shot from the right side of the box misses to the right. Assisted by Samantha Mewis. Attempt blocked. Samantha Mewis (Western New York Flash) left footed shot from outside the box is blocked. Assisted by Abby Erceg. Second Half begins Washington Spirit 1, Western New York Flash 1. First Half ends, Washington Spirit 1, Western New York Flash 1. Attempt blocked. Francisca Ordega (Washington Spirit) right footed shot from outside the box is blocked. Assisted by Estefanía Banini. Attempt saved. Christine Nairn (Washington Spirit) left footed shot from outside the box is saved in the bottom left corner. Assisted by Estefanía Banini. Attempt missed. Christine Nairn (Washington Spirit) right footed shot from outside the box misses to the right. Crystal Dunn (Washington Spirit) wins a free kick in the defensive half. Jaelene Hinkle (Western New York Flash) wins a free kick in the defensive half. Offside, Washington Spirit. Estefanía Banini tries a through ball, but Crystal Dunn is caught offside. Substitution, Washington Spirit. Alyssa Kleiner replaces Caprice Dydasco because of an injury. Ali Krieger (Washington Spirit) wins a free kick in the defensive half. Attempt saved. Estefanía Banini (Washington Spirit) right footed shot from outside the box is saved in the bottom left corner. Assisted by Ali Krieger. Hand ball by Abby Erceg (Western New York Flash). Delay in match Caprice Dydasco (Washington Spirit) because of an injury. Offside, Washington Spirit. Kelsey Wys tries a through ball, but Francisca Ordega is caught offside. Goal! Washington Spirit 1, Western New York Flash 1. Samantha Mewis (Western New York Flash) right footed shot from outside the box to the bottom right corner. Assisted by Lynn Williams. Goal! Washington Spirit 1, Western New York Flash 0. Crystal Dunn (Washington Spirit) right footed shot from the right side of the box to the bottom left corner. Assisted by Megan Oyster. Corner, Western New York Flash. Conceded by Megan Oyster. Attempt saved. Samantha Mewis (Western New York Flash) right footed shot from outside the box is saved in the centre of the goal. Assisted by McCall Zerboni. Attempt blocked. McCall Zerboni (Western New York Flash) right footed shot from outside the box is blocked.